And an unskilled mortician. Here's one that was done better. WARNING: GRUESOME PHOTO LINK BELOW. Johnson was shot to pieces, and left for 2 days in high heat, with wild animals and insects. Every entry wound, exit wound is a highway into the body for insects. His body was in horrible condition. 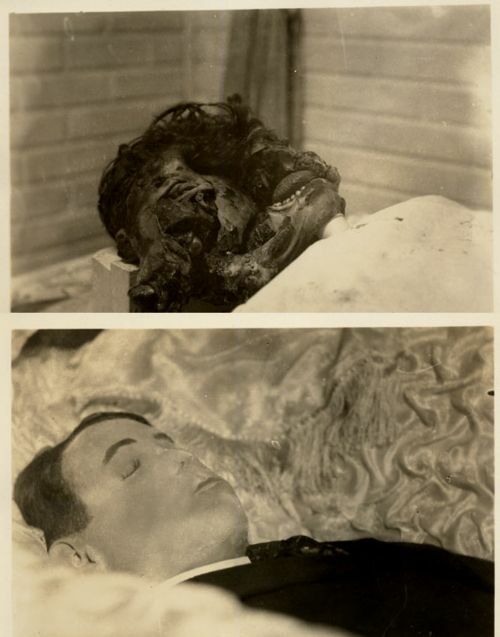 If any of you want to see what it looks like, in a somewhat safer medium, google pictures of the dead from the civil war. There are plenty on the internet of soldiers left in the field. About two hours after the US troops called in for additional support, seven of the 11 soldiers were reportedly evacuated by French helicopters, leaving four US soldiers — three of them Green Berets — behind, reports The Times. US officials in the report suggested that other US and coalition assets were nearby when the helicopters took off. Sgt. Johnson was either trying to self evacuate and hunted down, or taken away alive and executed. Either way, he gave his life for all of us. God bless all of you, and your families. Last edited by Oldhag1; 11-25-2017 at 04:23 PM.. It depends on the condition of the face if they let you see it. I think some of you are confusing should remains be viewed with military standard/protocol for viewing remains. Let's get one thing out in the open. While remains are in possession of the military, it is military property subject to the rules and regulations of that military property. The family has no right to view the remains until the remains have been released. Exceptions are for identification or under command authorization. Otherwise, families seldom get to see the remains until they have been finalized. Once the military releases the remains to the family, the decision of viewing rest with the family. The US military has no control or authority over the remains after release from their custody. There are times when the remains stay within the control of the military; usually when a burial is at a National Cemetery and the family has declined a transfer to a private mortuary for service or viewing. Example is an immediate internment. So the issue of the condition of the remains is meaningless in the conversation as far as the military allowing viewing or not. Many NOK have been confused and disoriented when they viewed the remains and instead of a physical body laying in front of them, it was just a uniform. However, under the uniform tray is the container holding whatever is that servicemeber, regardless of the condition. A civilian mortuary may have forgotten their briefing or just didn't want to deal with or subject the grieving family to what may just be the most haunting sight they will see if the actual remains are shown. Last edited by Oldhag1; 11-25-2017 at 04:24 PM.. The military does not prevent the next of kin from viewing the remains. It was probably a very strong suggestion that she not look at her husband and that she remember him the way he looked when she last saw him. You can't un-ring a bell. Once you have seen the corpse that is the last picture of them in your head forever. The Air Force Colonel at my son's base assured me that he was given a new uniform and was made presentable in case I wanted an open casket. I didn't. I wanted to remember him alive. But, the military in no way tried to make up my mind for me or get me to do things their way. They couldn't have been any kinder than they were. I agree with you. Iremember reading that they do have the option to see the body. Like you, I would want to remember him alive. I think this whole this is what was said vs interpretation. It should and always should be the choice of the NOK. If no NOK can be found, then it should be up to Uncle Sam. Believe me, the military has a budget for this kind of thing...."cheapest and easiest" is irrelevant. Additional remains of U.S. soldier Sgt. La David Johnson were found on Nov. 12 at the site in Niger where his body was recovered, a U.S. official confirmed for ABC News. An independent investigation of what, exactly?